Pelican utilizes a high-grade coconut shell based catalytic coconut shell based activated carbon in the Pelican Carbon Series Premium Whole House Water Filters. GAC filtration is recognized by the Water Quality Association as an acceptable method to maintain certain drinking water contaminants within the limits of the EPA National Drinking Water Standards. Activated carbon works by attracting and holding certain chemicals as water passes through it. Activated carbon is a highly porous material; therefore, it has an extremely high surface area for contaminant adsorption. Adsorption is the adhesion of atoms, ions, biomolecules or molecules of gas, liquid, or dissolved solids to a surface. The process of "adsorption" is highly different from the definition of "absorption." Where "absorption" occurs when a substance penetrates a solid, "adsorption" refers to a substance adhering to the surface of a solid. Activated carbon is utilized in the adsorption process, and is most often involved in the purification of drinking water. It can be made from several materials, of which, the most popular are coal, wood and coconut shells due to the large size of their surfaces and the extent to which they are porous. The larger the pore size and surface area of the media, the longer the activated carbon functions. Activated carbons are manufactured from coconut shell, peat, hard and soft wood, lignite coal, bituminous coal, olive pits and various specialty materials. Manufactured by chemical or high temperature steam activation, this highly porous adsorptive medium has a complex structure that is composed primarily of carbon atoms. Its network of pores within a rigid carbon skeleton consists of disordered layers of carbon atoms which are linked together by random chemical or carbon bonds. These carbon layers are stacked unevenly, creating a structure with various shaped and sized cavities between the carbon layers. The basic mechanism through which activated carbon removes impurities from gases or liquids through the attraction of molecules into this network of pores is referred to as adsorption. Adsorption is the key to the performance of activated carbon. Pelican uses non-chemically impregnated coconut based activated carbons that have been surface modified during manufacturing. This surface modification significantly enhances its ability for superior removal efficiency and rapid decomposition of chlorine and chloramines. Coconut shell activated carbon is the preferred carbon to remove volatile organic compounds (VOC's) from drinking water in POE systems. Coconut shell Activated Carbon (AC) is also more environmentally friendly or green. The coconut tree produces coconuts three times a year. The tree is not killed to harvest the coconut shells; therefore it's from a renewable resource. 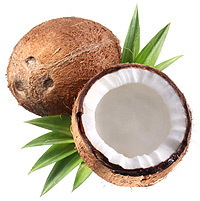 In addition, part of the carbon dioxide produced during manufacture of coconut shell carbon is removed by the coconut trees and produces oxygen.